Bloomberg Funded WAR in Minnesota! That’s what Mark, from Duluth, told us over the phone last night as many of you have contacted us about the massive gun control protests going on in Minnesota — and across the nation — this weekend. Simply put, many Minnesotans are just now being awoken to the harsh reality that anti-gun activists are mobilized and having a very real impact here in Minnesota. From banning the ever-popular AR-15, to establishing a statewide firearms registry, to Slocum’s HF3022 which would effectively DESTROY our gun rights — they want it all. If you didn’t see our footage from the gun-grabbers event in St Paul, check it out here. And, what’s more, they are being bankrolled by Michael Bloomberg, the NYC billionaire who is surrounded by 24/7 armed security. But much worse than his funding of this one-day public relations stint, is what he’s doing in the halls of the legislature in St Paul. All session long, our legislature has felt the force of gun control activists who have been crawling through the capitol and crowding committee rooms by the hundreds trying to hammer gun control bills into law. We’ve told you previously about Rep. Linda Slocum’s HF3022, which would effectively destroy our gun rights entirely by making nearly every semi-auto firearm illegal and imposing extremely heavy restrictions! Now we have Lyin’ Senator Scott Jensen (R-Chaska) linking arms with anti-gun militant Senator Ron Latz and sponsoring Bloomberg’s Universal Background Checks. All in all, there are nearly 30 gun-control bills in the works in St Paul — many sponsored by Republicans like Scott Jensen, Keith Franke and Paul Anderson! The bottom line is that Minnesota Gun Rights — and gun owners state wide — are in the fight of our lives in St Paul right now! And with the end of the session 8 weeks away, primary elections only a few months away, and the all-important 2018 midterms right around the corner, I hope you’ll get involved in this fight immediately by joining MGR. A basic Liberty membership is just $35, less than $.10 a day, and comes with a free bumper decal! Our Freedom level membership is only $75 and comes with a decal and FREE MGR T-Shirt! The Patriot level membership lands at $125 and comes with a decal, FREE T-Shirt and our signature “No-Guns-No-Money” cards! Our Lifetime memberships come with decals, a FREE T-Shirt, 5 “No-Guns-No-Money” cards and a wooden lifetime membership plaque! As gun owners, we know that the rights that we have are due in large part because of the generations of gun owners that went before us and fought to secure our freedoms. Minnesota Gun Rights won’t let up, we won’t give an inch, and we won’t back down –- not ever! And if you haven’t already, click on this link and press “Going” to come to the 2018 Gun Rights Rally at the Capitol in St Paul next Saturday, March 31st, and help us STOP this gun-control freight train! P.S. 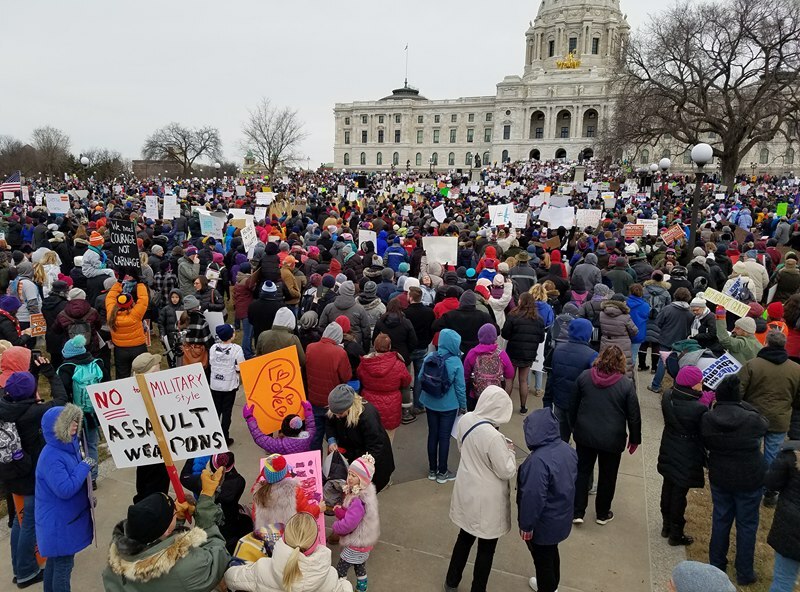 Being whipped into a frenzy by the liberal media, and funded by Michael Bloomberg’s war-chest, nearly 20,000 thousand anti-gunners marched in St Paul this weekend demanding gun-control. As we saw yesterday, the radicals from Bloomberg’s brigade aren’t going to compromise, aren’t going to let up, and they’re committed to crushing our gun right in the Capitol, too. MGR is working around the clock to identify, organize and mobilize a grassroots ARMY of gun owners like you from around our state to FIGHT BACK! So if you’re not already a member of Minnesota Gun Rights, please join TODAY! And, if you’re already a member, please make a special contribution to help us maintain the fight in St Paul, right away! And if you haven’t already, click on this link and press “Going” to come to the 2018 Gun Rights Rally at the Capitol in St Paul next Saturday and help us push back against this gun-control freight train! 2018 Gun Rights Rally Recap!